Several people have asked about my home-made pump, so this time round I’ll give a few details about it. This is really a follow up from an earlier article. Above is a photo of the pump, I made it many years ago when there was only one filling station locally and next to no competition. In addition, a local tool hire place did 47kg cylinders at a price that made it worth pumping my own gas. As I wrote in the earlier article, this largely came about as a result of a chance meeting at the filling pump, and the offer to borrow a hand pump the guy had made. 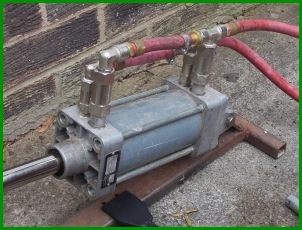 The key parts are the cylinder, in this case a 100mm diameter by 100mm stroke pneumatic cylinder, and a few non-return valves (the four cylindrical fittings screwed into the top of the cylinder). 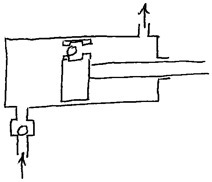 Operation is quite simple - as you pull the piston out, gas is drawn into one end of the cylinder through valve A and pushed out of the other end through valve D; when you push the piston back in, valves A&D shut and gas flows through valves B&C. So in this design, you pump gas on both strokes. One problem I found with the borrowed pump was the difficulty of drawing in liquid through the non-return valves A&B. Because they were spring loaded, there was a pressure drop and this caused the gas to vapourise – pumping vapour is not very efficient ! This was fixed by removing the springs from the inlet valves. It’s not a problem with the outlet valves (C&D) as the liquid is being pushed through these and so there is no loss in pressure to worry about. The rest of the plumbing comprises a number of small brass fittings as you can see. At the other end of the hoses I used some small pneumatic hose couplings, and small brass ball valves to shut off the hose ends. This allows me to screw in the adapters without all the pipe twisting that would otherwise be required, and the ball valves prevent the gas in the pump and hoses escaping. An additional reason is that by making two cylinder adapters, it allows me to pump from one cylinder to another, for example, to refill the small cylinder used in the workshop. WARNING: Should you decide to do this, you must make sure that you never fill a cylinder more than 80% full, there is no valve to automatically prevent over-filling. This is not the only way of arranging the valves – there is at least one commercial vendor (Krug) with (I think) an arrangement like this. Here, there is just one inlet valve, and a valve in the piston itself. 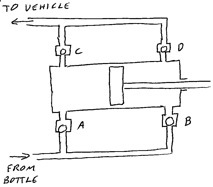 As the piston is pulled out, gas is pushed out to the vehicle, and fresh gas is drawn in from the bottle, as the piston is pushed in, gas is transferred from the left side to the right side of the piston and a small amount is pushed out to the vehicle as the piston rods takes up some of the space in the cylinder. All that is left is to make a frame to hold the cylinder, and a suitable handle to allow you to pump it. You will, of course, need to hold the whole lot still, and for this I added a bar that I can park one wheel of the vehicle on which keeps it all in place. There are some more pictures here.